Considering that Aiken was born in 1889, it’s interesting to read his comments about the conflicting schedule demands facing the commuter. Apparently our frustration at having too little time is nothing new. In most respects my life bears little resemblance to Aiken’s, but I certainly connect with his observation that time spent in the garden must be seized from other claimants. My excuse is that it’s more beneficial to my spirit than it is to the plants I tend. Whether you have a large garden, a small flower bed or just a potted plant or two, I highly recommend the therapeutic benefit of botanical pursuits. As Aiken attests, even small bits of time spent in the garden are wisely invested. ← Slowly — but painlessly! Yes, I’ve thought many times about how Jesus retreated to “his” garden in his darkest hours. The first time I ever saw olive trees, I thought how peaceful they looked and what cool shade they must have created. Thank you for something peaceful and beautiful to start the day. There’s turmoil in the news today and your blog provides a respite from the bad news and heartache in Boston and Texas. Yes, Ann, the news lately has been heartbreaking indeed. My husband sent me a wonderful video from the late Fred Rogers (made after 9-11) which was a solace to me; I am thinking of doing a special blog post with it here. I am so happy if this blog provides a respite — that’s the reason I started doing it and it does help me tremendously to have others joining me in the determination to “defeat despair” from all the sorrows that threaten to engulf us. Thanks for being here! Following my oft repeated motto,” The key to inner peace is the studied ability to adapt to change.”My increasing physical limitations seemed to preclude the strenuous aspect of vegetable gardening but I have found this year that I can do quite well if I simply work on my hands and knees. Gardening can be a great calming activity. And I’m so glad you are still able to enjoy it! Not just because it’s good for you, but it’s good for US, too, when all those fresh-picked vegetables show up on Mama’s table. Nothing so delicious as food that was gathered just a few hours earlier! I think it’s darling to receive a hand written note and I’m sure your recipients feel the same 😀 Wow, you’re planned ahead…4-28? I’m in awe! Actually I stay about 2 weeks ahead most of the time. When I decided to blog every day I knew I would need to do that because there are so many days when Jeff’s or Matt’s medical appointments take up almost the whole day, and of course, there are always days when other things are planned. Sometimes I re-arrange the dates, like during cherry blossom time I had to keep moving the cherry blossom posts to later dates because they were so late this year. Having a “buffer zone” of posts done takes off the pressure. I LOVE good old-fashioned snail-mail! Hope it doesn’t die out altogether; I’m trying to do my part to keep it going. My British pen pal and I have been writing to each other the old-fashioned way for nearly 23 years now (though not always handwritten) even though we have only met once. I need to get a letter out to her, I’m way behind on so many things! 23 years of being pen pals is so cool, Bravo. Hope you get a chance to meet up again along the way! So do I! I also hope to meet many of my online friends in person someday! Thanks for being here. Hi Sheila, I’ve been known to appear just outside the door in my robe from time to time also! Some lazy weekends I even stay in my robe until after breakfast. I am so glad my parents like to garden. I do think it is a great help to all of us to tend to things…plants, pets, kids, whatever! Even ourselves. 🙂 Hope you and Bill have a lovely weekend too. I like the results of a garden but seldom take much joy from the actual gardening. It’s not that I mind dirt its that the bugs seem to come out and eat me alive, I spend the whole morning in the garden center buying the bedding plants then I am too tired to put them in the ground or what was an easy project for my neighbor manages to be a nightmare for me. OH well. I will just have to enjoy your photos and keep going to places like Kuekenhoff (ha ha) You will be happy to know that my Hydrangea is doing beautifully so far this spring. Hope I get some great flowers on this year. The Hydrangea can be my example, The ground was rock hard, the sun was shining and it was hot. Stephen was helping me and the bugs were buzzing around me (and only me) so badly my then future son in law had pity on me and came to help Stephen dig so I could watch from the window. It did not bloom beyond what it had on it at the shop and the deer ate it down to the ground over the summer. I moved it in the fall closer to the house (Stephen almost refused to help it had been such a bear to dig the first hole) and the next spring it came back beautiful but still only had three blooms. The deer did leave it alone though there were many more of them than the year before. I guess because it was closer to the house. This year it looks gorgeous so we shall see what it does. I do think of you my sweet friend every day I see it. Have a great weekend. I am keeping you all in my prayers. Amy, I’m so happy the hydrangea finally came around. Sometimes it just takes awhile, although ours have on and off years, never exactly the same, and I always wonder what makes the difference? Yes, we will definitely have to plan another trip back to Keukenhof and some other nice gardens that are closer. Mount Vernon has lovely gardens, maybe we can take a day to go there soon. Thanks so much for your prayers, they are being answered! And thanks for being here. 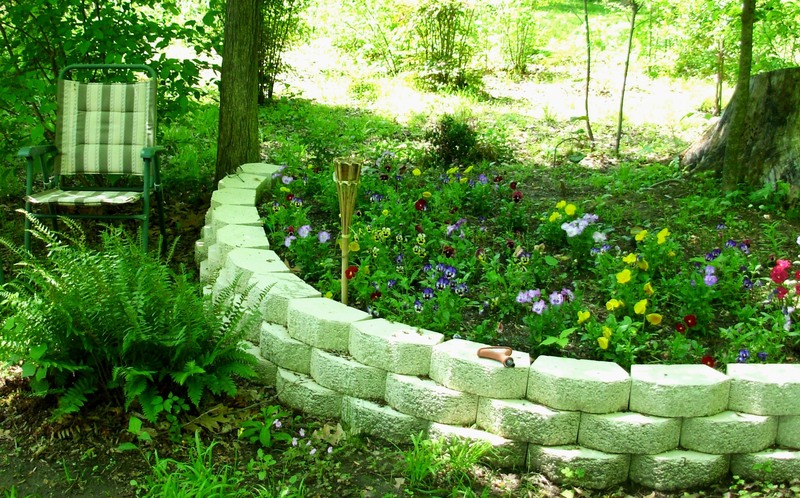 Thanks Alys, your blog title “Gardening Nirvana” says it all! Thanks for being here.